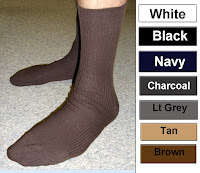 Wittmann Textiles Company: Is it possible to find Men's Cotton Dress Socks made in the USA? Is it possible to find Men's Cotton Dress Socks made in the USA? Cotton socks have become harder and harder to find in department stores and major chains. Online, it can be a challenge to find exactly what you are looking for in cotton fiber content or the weight of the socks that men need in colors or styling. 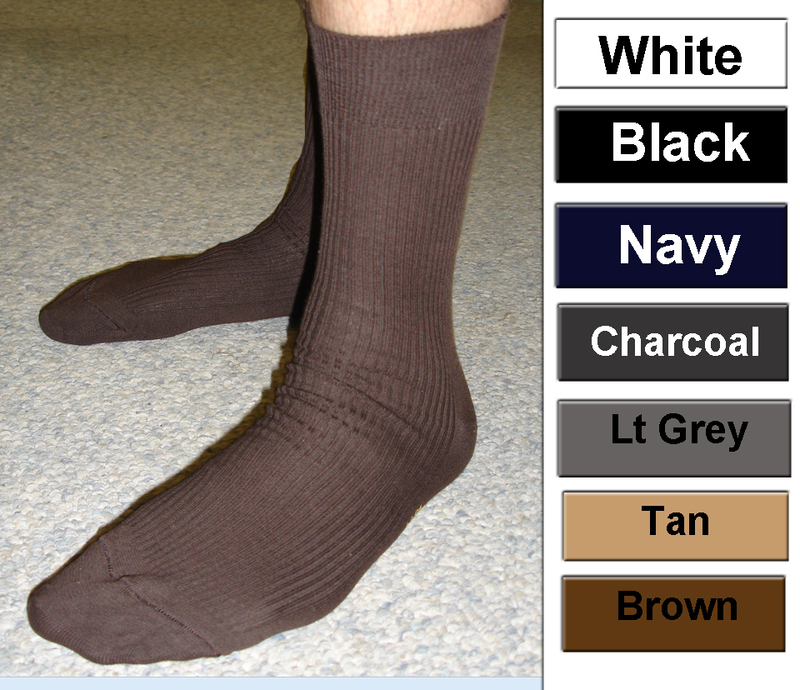 Fortunately, Wittmann Textiles Company offers many of these hard to find cotton socks in styles from Dress weight to heavy weight for hiking and walking. The Mens Cotton Dress socks above are specially designed for two specific purposes. The Comfort Top Cotton Mens Dress sock is for people that need 100% cotton, but want a sock to give way as the day goes on so not to leave marks on the ankle. Because of this giving way, if there is no swelling the sock may tend to fall down as the day goes on. So, if someone wants the mostly cotton comfort but needs the sock to stay up and doesn't mind just a little elastic in the very top of the sock, then a better choice will be the 99% Cotton Dress sock. Both of these very popular Cotton Dress Socks offer many color choices that will surely be a great addition to his wardrobe and match many of his suit or pant choices. These light weight dress socks will easily slip into dress shoes and be very comfortable and soft. Since these are a high content cotton sock and thin, you may get less wear than a sock that has added nylon or other fibers for longer wear. But it is a trade off between the comfort (feel of soft cotton) and how durable the sock need to be for the person wearing them. Men's Cotton Dress Socks make footwear comfortable again, but if you need a heavier weight in cotton socks, we have those too at Wittmann Textiles Company! We are easy to reach by phone Monday through Friday 9 AM - 4 PM Eastern time at Wittmann Textiles Company. 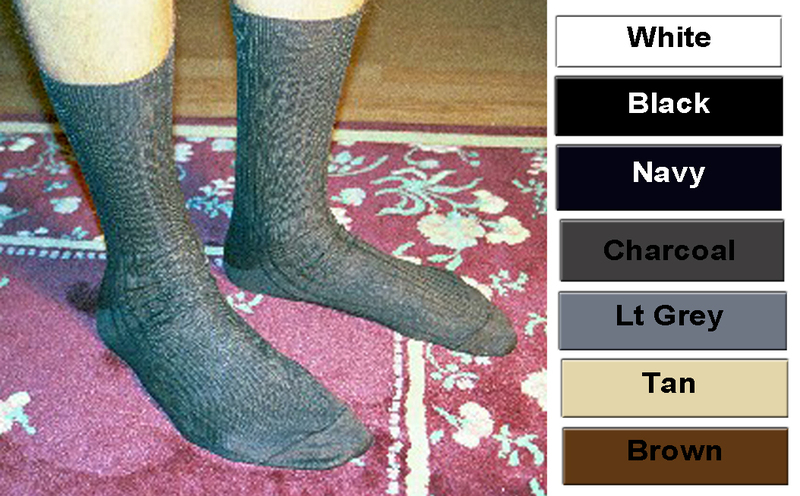 You can tell us exactly what you are looking for in a sock and we'll let you know what we offer that will do the job. Many times if we know of a sock at another company that could help you better, we will let you know. We want to help you get the best sock, the very first time. We have some hard to find popular Diabetic and Wool Socks too.